using the store’s $11,000 Clover brewing system. New York (Tadias) – Café Grumpy, a local coffee shop chain here in New York, is raising eyebrows with its new menu item – an expensive cup of joe from Ethiopia. 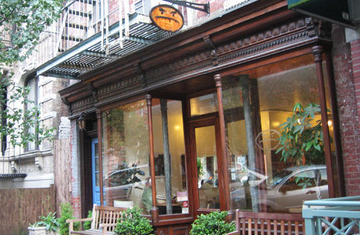 The Manhattan location of Café Grumpy is selling the drink brewed from the handpicked Ethiopian Nekisse beans for $12 a cup. And why is it so pricey? It is nothing but supply and demand. Supply or demand, $12 a cup is a heck of a lot money for coffee. Of course, if you are a regular working American, or not working in today’s case. But you have to give it up for the capitalist spirit of Cafe Grumpy. At least they are upfront about it, unlike Goldman Sachs. What otherwise you would buy makes this coffee expensive. Compare the price with hair cut, for example, which will take you for two weeks. How many of the consumers go back to sip one more time with the same price? Ethiopian coffee is like fine wine from France or cigar from Cuba. The finest things in life come with a price tag. Deal with it. The truth is that there are lots of hyped coffee beans out there! Funny thing is that the only thing unique about them is how expensive they are and how many people buy into the concept. I can say, for example, I pan roast Ethiopian coffee for the price of $15 per pot and 1/2. People complain like they always do. Not only can you taste the difference, but you can also see the difference as far as the work that is involved with pan roasting. My Ethiopian Sidama scored 4.75 out of 5 points. The only coffee to score higher was Kopi Luwak! Was it hype or quality? Regardless, in retrospect from a taste profile perspective, my coffee is dirt cheap in comparison. This is $12 a cup so I need to push my pan roast out the door..
1. For one thing, let us clear some facts of coffee beans gathering in Ethiopia. For all I know, and I think I have been to almost all coffee producing areas, normaly coffee is picked from the tree not after it has fallen to the ground. That “it is picked from the tree” is a given and not a qualifier for Ethiopian Coffee. 2. I have been a coffee consumer since the age of 10 or 11. The best coffee in Ethiopia that I know of is produced in Amarlo-Kello, a locality accroos the “Bridge of God” (Yegizer Dildiy) across the Lakes Chammo and Abbaya going from Arba Minch. It is on the Gedé’Ö side of Sidmo Region. The thing about this coffee is that the beans are tiny in comparsison and when you roast them, it is like roasting an oilseed. Oil oozes out. The taste is distinctly diffrent and I can recognize it blindfolded anywhere including here in the US of A. The amount produced is so small and usually ends up in Arba Minch, the closest big town, where it is a local favorite. 3. The thing about the $12 cup coffee (Nekisse beans) does not have the name of place of birth (NPB). By divilging this local “secret” I am not sure wether I am doing favor for the People of Amaro Kello and disfavor for Arba-Minch. Now you Know! Don’t be grumpy folks. If people are willing to pay Cafe Grumpy $12 for a cup of joe, all power to them. Good job Cafe Grumpy. And good job Ethiopian coffee farmers! I agree with BaristaOnDutY. Coffee is all about the roasting. Where the beans come from has very little to do with it. But I imagine Cafe Grumpy paid a little bit more for these beans than the regular coffee kind, so they feel justified to charge $12 a cup. Well, this is in New York after all. They may just be playing a number on you (Did somebody mention Goldman Sachs?). Yes, will gladly pay $12 for specialty Ethiopian coffee. It is the best in the world. The experience is worth it!!! I wonder how much the poor coffe farmer in Ethiopia gets out of the $12 per cup. Not much I bet. Ethiopian coffee is a delicacy and the taste more than justifies the price. Hey, it’s not for everyone, but once in a while treat, it is SO worth it. 12 $ for cup of coffee!! – you can buy 2 kilos of the same coffee in Ethiopia. If we are talking about status of the Café why not make it 12,000. Again another pricey coffee! Nothing is in it for the poor farmers in Ethiopia! When has coffee created ever such a buzz? Some folks may think this is a lot of hype, but I, for one, think this is exciting news. It may awaken people to the reality that Ethiopian coffee is the best in the world and, when carefully roasted and brewed, can be as tasty and satisfying as a glass of fine wine. I look forward to the day when high-quality Ethiopian coffee commands the price it deserves and the farmers who work so hard to cultivate, harvest and process it benefit accordingly. In the last few days, the news of a $12-dollar cup of Ethiopian coffee attracted the entire news media attention. This news was virtually covered by major networks, electronics and print media. The amount of response and opinion the news generated is immense and is still increasing by the seconds. We have had a chance to try this coffee way before the current excitement. We would like toadd our impression of Ethiopian Nekisse micro lot selection to the discussion. Before reading our observations, we would like everyone to know how we handle the roasting of our coffee as well as the cupping procedures we follow. We could have said a lot more about Nekisse; Each one of us had slightly different readings on flavor and aromatic notes. We’ve posted only the description that we all agreed upon. For those who drink coffee regularly, the greatness of Nekisse is very easy to identify. Even for the occasional coffee drinker, the rare and unique nature of Nekisse is hard to miss. The minute you grind this coffee, you will be covered by inescapable aroma. After you are done with brewing and have your first sip, your front pallet will register the upfront sweet and fruit notes immediately. It is almost impossible not to feel the unique character of this coffee. Last year, we had the privilege of offering one of the greatest coffees that Ethiopia has ever produced in recent memory. That same coffee went on and won the Coffee of the Year competition, the highest award in the industry. We at Revocup and our customers who have purchased it have had an unforgettable experience with Aricha micro lot selection 14. The difference between Aricha 14 and Nekisse is that Aricha is more fragrant, super floral and sweet forward than Nekisse. Also, Aricha has an explosive blueberry note that carries through start to finish. In terms of body, mouthfeel, and aftertaste, they appear to be similar. 1- Why are some coffees extremely unique and distinctive? 2- Why is Ethiopian coffee so great? 3- Why is Ethiopian coffee production yield so low? 4- Why do Ethiopian coffee farmers earn a lot less than any other coffee-producing country? 5- What needs to be done? What kind of policy should we craft and implement in order to earnmore money? We have similar coffee shop here in Denver. Was there once by accident and have had myself unpleasantly surprised by the price ($10 a cup). Couldn’t taste the difference vs. Star Bucks anyways. Just HOW much do the farmers back in Ethiopia get for doing the hard work for the 12 dollar coffee? Just saying. In developed parts of the world at large you cannot see the farmers of the coffee industry in the time consuming and tedious task of harvesting and processing coffee. Take this and add exponentially, the time, effort, and ingenuity of preparing specialty grade coffee. This is the top grade, less than 10% tier of the coffee produced in the world. When you buy expensive coffee from a farm-gate, or fair trade direct price, you’re casting a vote to give more money to hard workers. Workers who have well earned their wages. Supply and demand is cold, and tunnel-visioned. The specialty coffee industry at large is putting the extra money you spend on coffee and trying to turn it over back to the farmers to sustain (most farms don’t earn enough to even keep farming from distilling their work into 2.50 a cup) and improve their work.